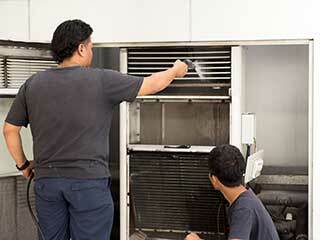 Our professional HVAC Unit cleaning service can help you save a money! Air quality in your home is hugely important, especially if you have children or any elderly members in your family! Our company can assist with our air quality testing and HVAC unit cleaning services so you won’t have to worry about any pollution in your home’s air. One of the best first steps to take when it comes to improving your home’s air is to get it tested! That way you can know with certainty where it stands, and what in particular is causing any negative impact. There are many factors that contribute to the quality, from dust and pet dander, to overuse of any pesticides. Our team will be able to assist you in learning all you need to know with one easy test! Another great service to have done to better your air is to get your HVAC unit regularly cleaned! While it’s pulling in air for heating and air conditioning, other substances like dirt and even pollution in the outdoor air is brought into the unit and get stuck in it. These materials easily taint the air as it passes through into your home, and can be a big contributor to its low quality. Rather than risk your family’s health, especially if anyone already has breathing issues such as asthma, just let our professionals get it cleared out right away! Using the best tools and our years of experience, our team will dislodge and suction up all of the blockages easily without risk of cross-contaminating the air. That way you and your family will be able to breathe easier in no time! It can also help save you on energy, so there’s no reason to wait. Take the first step towards improving your home’s air quality by scheduling your HVAC unit cleaning and air quality testing! Our experts will have it all completed before you know it. Just contact Air Duct Cleaning Pasadena! You’ll be glad you did.